KONG is coming back this summer to Morey’s Piers in Wildwoods, NJ. Once an iconic boardwalk landmark in early 1970s, the brand new gorilla themed amusement ride will open on the Memorial Day weekend serving as the new centerpiece of the Surfside Pier. KONG is coming this summer to Morey’s Piers & Beachfront Water Parks, the classic seaside attraction located on the boardwalk of the Wildwoods, NJ. Once an iconic boardwalk landmark in early 1970s, the brand new gorilla themed amusement ride will open to the public Memorial Day weekend serving as the new centerpiece of Surfside Pier. 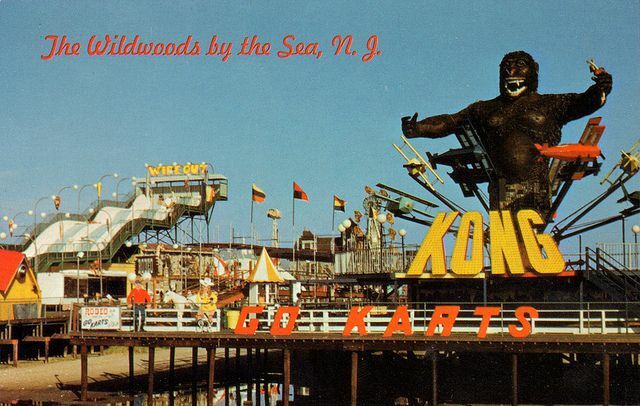 KONG, snorting smoke and fog, will sport an “I love Wildwood” t-shirt and clutch one of Wildwood’s well-known tram cars while hanging from the 60 feet tall lighthouse at the ride’s center. Eight vintage world war planes will duck, dive and navigate around the infamous gorilla, bringing riders 26 feet in air. After sunset, KONG will light up the night sky with a rotating light on top of the lighthouse and enhanced LED lighting outlining each ride vehicle. Underneath the ride is Kong & Co., a new 3,000 square foot retail space offering charging stations and comfy chairs, as well as chocolate covered frozen bananas and merchandise for purchase. Prices per night start at $138 at the Pan American, $146 at the Port Royal, $101 at The Starlux and $100 at the Blue Palms Resort, based on double occupancy. Two night minimum required. The “Walk on the Wild Side” package is available for stays Sunday to Thursday, between June 14 and July 9, 2015 at the Pan American and Port Royal, and June 14 through July 23, 2015 at The Starlux and Blue Palms Resort. Rooms are subject to availability; price does not include hotel tax. To book, guests can call the resort and mention the “Walk on the Wild Side” package. From April 6 through May 17, Morey’s Piers fans will have the chance to win the ultimate KONG ride experience by entering the Conquer KONG Contest hosted on the attraction’s Facebook page. One lucky winner, along with nine of their friends and family, will receive all day ride passes, a half hour of exclusive ride time on KONG prior to the piers opening, KONG souvenirs and a pizza party. To enter, visit https://www.facebook.com/MoreysPiers and enter a valid email address. Entrants who share the contest on their Facebook page will earn a second entry. Must be 13 years or older to participate; winners and their guests must meet the ride height requirement of 44” tall to ride alone; 36” to 44” tall must be accompanied by a supervising companion. Under 36” tall not permitted. For more information on Morey’s Piers & Beachfront Waterparks, please visit www.moreyspiers.com.